Susan Millard Schwarz is frequently hailed for her interpretive abilities as a vocal artist. Her musicality is revealed through her vocal warmth and color, and the sensitivity with which she shapes her melodic lines. A person of faith, she has great interest in whatever spiritual quality there may be within a piece of music. This may be a depiction of the natural world, as is found in German Lieder, or it may be a direct message from the Bible, as is frequently found in Christian Science repertoire. And sometimes, a song that carries a simple reminder that we are not alone is enough to deliver deep healing to a listener’s heart. Susan has said she is most gratified by vocal music that not only fits her voice, but that carries meaning, whether by text, or by music, or both. The best comments for her are centered on what personal messages her presentations hold for her audiences. Susan also greatly enjoys working with others onstage, or in the studio. She believes it is always wonderful to be a solo artist, but there is nothing like having the experience of collaborating with other performers, and benefiting from their inspiration, skills and creativity. 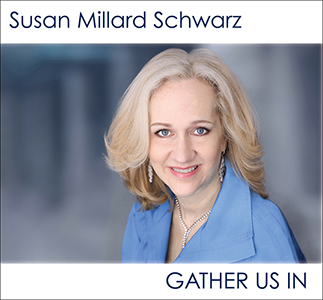 Susan Millard Schwarz was born in Steubenville, Ohio, into a family who relied on the Weirton Steel Industry, but who also valued Christian, college education for younger generations. Coming from a long line of United Methodist pastors and song leaders, Susan developed a love for Christian music and worship. In high school, she became steeped in music and theatre. She continued to pursue these fields at Asbury University, a Christian institution, and then earned her masters of music degree in voice performance from The Ohio State University. She since has led a professional career in opera, oratorio, musical theater and concert work. After holding soloist/section leader positions for various churches, she accepted the invitation to sing for a Christian Science church. To her delight, she discovered a new trove of wonderful vocal music, which she wanted to introduce to a larger audience. Her recent album, “Gather Us In,” which includes songs from Christian Science origins, is her first solo recording project. Susan is CEO of Anahata Music Project LLC, through which she launched the online Musicians Directory™. A devoted follower of Christ, she enjoys a loving, interfaith household with her husband, extended family, and their numerous animals.